ICONS: Book of Hours: Time For a Record? 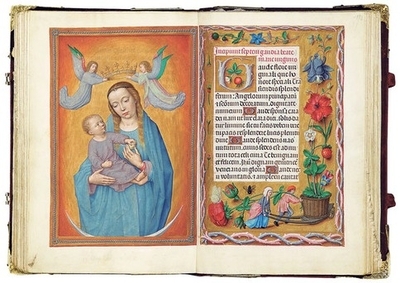 A lavishly illuminated medieval Book of Hours, which set the world auction record for illuminated manuscripts when it sold in 1999 for nearly $13.4 million, will be back on the block next Wednesday, expected to fetch an even higher price. Christie's will offer the Rothschild Prayerbook, often considered the most important illuminated manuscript in private hands, in New York. No one knows who commissioned the 150-page book, which was made in Ghent or Bruges around 1505-1510, but it was probably a member of the imperial court in the Netherlands. Christie's hasn't identified the seller. "It contains within its covers some of the finest paintings by major, major illuminators," said Roger S. Wieck, curator of Medieval and Renaissance Manuscripts at the Morgan Library & Museum. 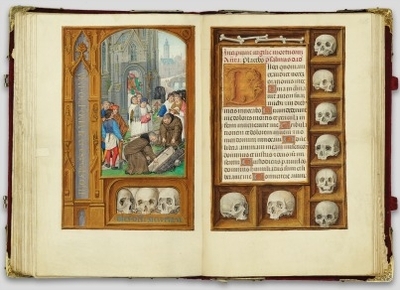 Gerard Horenbout, Simon Bening and his father, Alexander Bening, created many of its 67 full-page illuminations. Gerard David, a leading Early Netherlandish painter, made the book's most famous image, a Madonna and child on a crescent moon (above left). The borders—decorated with widely varying images that include flowers, peacock feathers, shells, architectural elements, skulls, pearls and jewels—"are unbelievably bedazzling," Mr. Wieck said. Sometime in the 1800s, the book came into the possession of Baron Anselm von Rothschild (1803-74). It remained in his family until the Nazis appropriated the book in 1938. From there, it went into the collection of the Austrian National Library, and 1998 the Austrian government returned it to the family. The late Baroness Bettina de Rothschild consigned it to Christie's, which sold it in London the following July for almost triple its presale high estimate of about $4.7 million. Despite an art market that, overall, has risen substantially since then, Christie's has set the estimate conservatively at $12 million to $18 million. But Nicholas Hall, Christie's International co-chairman of Old Masters and 19th-century art, noted that the estimate is "considerably" above the level last time, and added "it's at the high end of the spectrum for this sort of object." To stimulate interest, Christie's has toured the prayer book to London, Moscow, where it received significant publicity, and Hong Kong, where Mr. Hall said it had attracted avid interest from one Chinese collector in particular. In general, he said, "there is very significant interest from both institutions and private collectors alike. " The J. Paul Getty Museum, which was reportedly the under-bidder in 1999 and is the likeliest American institutional buyer, declined to comment. The Morgan already owns a few comparable manuscripts and, given its limited acquisitions budget, does not intend to bid. Christie's also strategically placed the prayer book not in a manuscripts sale but with paintings and sculptures in its Renaissance sale – an attempt to entice paintings collectors. Said Kay Sutton, Christie's London-based Director and Senior Specialist of Books and Manuscripts, "It has 67 paintings, and that's almost as many as the rest of the Renaissance sale."